One of the advantage of working downtown right next to Honolulu Harbor is you can see all sorts of boats visiting Hawaii. 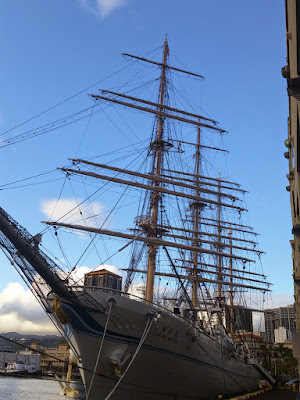 Here is the Kaiwo Maru which is a Japanese four masted training barque tall ship. It was built in 1989 and is 361 feet long and 45 feet high. In March of 2011 she was on a voyage to Japan to Honolulu when the Fukushima earthquake and tsunami struck Japan. She was rerouted to Fukushima and served as accomodations for works talking the nuclear crisis. Here is some additional photos and information from our coverage of Kaiwo Maru’s last visit. You can view this boat by Aloha Tower through Saturday 5/23/15. This entry was posted on Thursday, May 21st, 2015 at 12:45 am	and is filed under CityPhoto, Feature, Art, cultural, Hawaii Photo of the Day, Attractions. You can follow any responses to this entry through the RSS 2.0 feed. You can leave a response, or trackback from your own site.